Think way beyond ice cream. 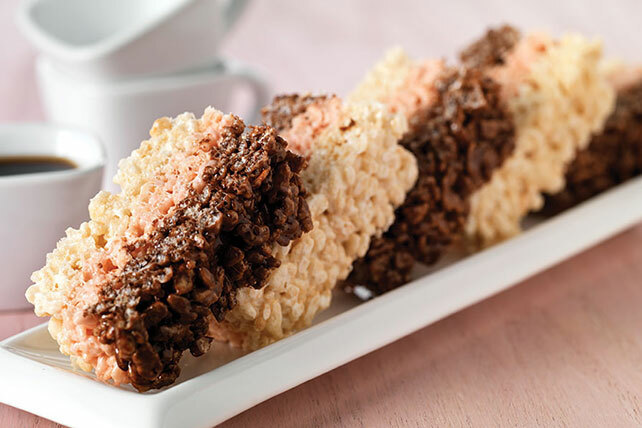 We used strawberry-flavor marshmallows and unsweetened chocolate to give RICE KRISPIES TREATS® a tri-flavor makeover. Microwave 1-1/2 Tbsp. butter in large microwaveable bowl on HIGH 30 sec. or until melted. Add 19 regular marshmallows; toss to coat. Microwave 1 min. or until marshmallows are completely melted and mixture is well blended, stirring after 30 sec. Add 3 cups cereal; mix well. Press onto bottom of 9-inch square pan sprayed with cooking spray. Repeat with 1-1/2 Tbsp. of the remaining butter and STRAWBERRYMALLOWS, pressing firmly into first layer in pan. Microwave remaining butter and chocolate in large microwaveable bowl 30 sec. or until completely melted. Add remaining regular marshmallows; toss to coat. Microwave 1 min. or until marshmallows are completely melted and mixture is well blended, stirring after 30 sec. Add remaining cereal; mix well. Press firmly into strawberry cereal layer in pan to secure. Cool completely before cutting into bars. For more chocolate flavor, reduce the Kellogg's® Rice Krispies® cereal measure to 6 cups. Then, use 3 cups Kellogg's® Cocoa Krispies® cereal to prepare the top cereal layer with the melted chocolate.